How Do You Become a Cardiac Nurse? The path to become a cardiac nurse is well defined because students must obtain the right education, license and experience. Cardiac nurses are RNs who only work with patients suffering from heart-related illnesses such as heart disease or failure. Students who want to become a cardiac nurse will need to complete a bachelor’s degree in nursing. The most popular and widely available program for nurses is a Bachelor of Science in Nursing degree. This degree will broaden the student’s knowledge of different medical areas, such as biology, nutrition and physiology. This degree will cover medical coding, terminology and assessments. To illustrate, a medical assessment class will introduce the student to standard physical assessment procedures and advanced interviewing techniques. After graduation, students will be ready to demonstrate their practical and professional competencies through the highest standards of clinical care. After graduation, nurses may choose to either take the PN or RN exam through the National Council of State Boards of Nursing (NCSBN). Cardiac nurses generally take the NCLEX-RN exam, which tests knowledge of the five-step nursing process: assessment, analysis, planning, implementation and evaluation. As way of illustration, the exam content includes questions about infection control, health maintenance and safe care practices. These questions may ask the student about proper sanitation procedures or preventative management. Other exam content covers pharmacology, psychosocial integrity and physiological care. 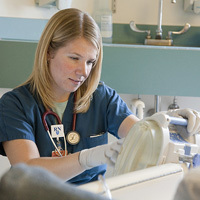 The computer-based RN exam is intuitive and responsive to each examinee. That is, the RN exam program will ask candidates at least 75 questions, but up to 265 questions in order to properly assess their knowledge and competency. The third step is to gain additional training and experience. RNs who work in a critical or intensive care unit will learn helpful decision making skills and gain hands-on experience working with acutely ill patients. Ideally, the RN will find work in a clinical cardiology, cardiac surgery or cardiovascular department. Because cardiac nursing is a highly advanced area, RNs will need additional training. The American College of Cardiovascular Nurses (ACCN) offers a wide range of specialized certifications for cardiovascular health care providers. They offer a CVRN-BC Level I certification for recent graduates and an Advanced EKG certification for nurses and physicians. Armed with a bachelor’s degree, RN license and the right experience, students will be able to obtain a job as an official cardiac nurse. These health care professionals will manage the care of designated patients through performing ongoing patient assessments, maintaining safe environments and implementing standards and procedures. Cardiac nurses use effective and appropriate communication styles to coordinate care with patients, family members and other health care team members. Cardiac nurses will have the necessary abilities and knowledge to ensure quality patient care during operative and mandatory care procedures. The most successful cardiac nurses will develop the ability to anticipate the needs of surgeons and cardiac experts. Students who want to become a cardiac nurse should obtain a bachelor’s degree, RN license and find employment in a cardiac-based unit or department.